and small animals that can't be found in many local pet stores. Take advantage of their monthly specials and free shipping on select items in their free shipping store! Cash back is not available for gift cards, gift certificates, donations, repeat delivery (aka bottomless bowl) subscriptions. 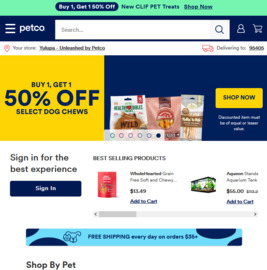 Click a Coupon or click Start Shopping to earn Up to 6% Cash Back at Petco. Online only. Terms and conditions apply.